One of only two Vermeer paintings in the Louvre, and the only one stored in a salt mine. Possibly, the subject was Vermeer's good friend Anton van Leeuwenhoek, discoverer of protozoa, among other things, and inventor of the first modern microscope. Thanks nerd! The subject's pose and dress could have been lifted from Rembrandt's etching of Faustus. But that can't be proven either way, so go easy with the accusations. The painting on The Astronomer's wall depicts Moses found amongst the Nile's reeds. The Moses painting is a 17th century Easter Egg, as the same work is also found in other Vermeer paintings. One interpretation for the Easter Egg could focus on the belief that astrology was a science originating in Egypt. The painting-within-a-painting could also be an allegory for astronomy's potential to expand our knowledge of the universe. Moses was figured as an allegory for guides. So, too, could astronomers become society's guides to an unknown, greater reality. Although, we'd Yelp the sh*t out of our guide if they lost us in the desert for 40 years, not immortalize them as an archetype and prophet. The Rothschild family owned The Astronomer before it was stolen by one of Hitler's art confiscation units (there were multiple units competing to be the worst around). Stealing this painting was basically their first task after invading France. The Astronomer was to be a focal point in Hitler's planned super-museum. But Goering wanted the painting, which was really irritating to Hitler who worked so hard for his army to steal it. Whose Third Reich was it anyway, Goering? Hitler had the last say by storing The Astronomer in the Steinberg salt mine at Altaussee, along with 9000 other works of art. The Monuments Men recovered it in the wake of Hitler's defeat. If this paragraph would be more interesting as acted out by George Clooney and Matt Damon, you could always watch the end of "The Monuments Men", which features the squarest jawed, big-armed silver foxes a moviegoer could hope for. The Astronomer is a painting finished in about 1668 by the Dutch painter Johannes Vermeer. It is oil on canvas, 51 cm × 45 cm (20 in × 18 in), and is on display at the Louvre, in Paris, France. Portrayals of scientists were a favourite topic in 17th-century Dutch painting and Vermeer's oeuvre includes both this astronomer and the slightly later The Geographer. Both are believed to portray the same man, possibly Antonie van Leeuwenhoek. A 2017 study indicated that the canvas for the two works came from the same bolt of material, confirming their close relationship. The astronomer's profession is shown by the celestial globe (version by Jodocus Hondius) and the book on the table, the 1621 edition of Adriaan Metius's Institutiones Astronomicae Geographicae. Symbolically, the volume is open to Book III, a section advising the astronomer to seek "inspiration from God" and the painting on the wall shows the Finding of Moses—Moses may represent knowledge and science ("learned in all the wisdom of the Egyptians"). 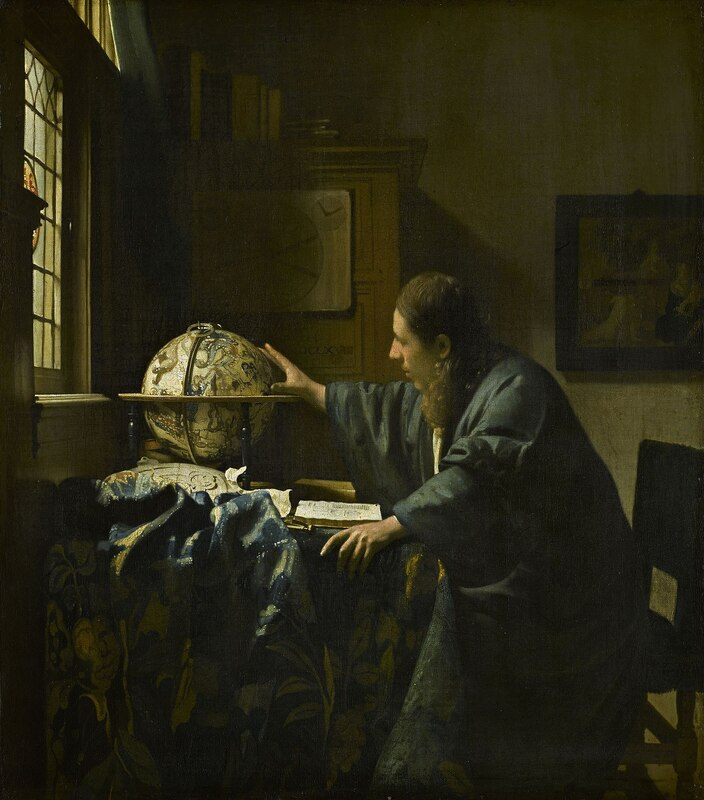 Check out the full Wikipedia article about The Astronomer (Vermeer).